Once in a while I come close, but in general I never grow enough peas. My garden produces plenty of mangetout for the table and snap peas for the freezer, but it's the sweet and tender shell peas that leave me wishing for more. Most of the problem is that we eat so many as snacks, because who can resist eating pod after pod of sweet green pearls, right in the garden? This year I am determined to grow enough shell peas to graze and freeze, which calls for a climate-specific strategy. 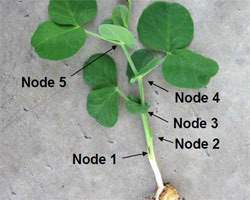 Weather has a huge impact on the growth and productivity of peas, which can grow fast or slow, depending on how much sun and warmth the plants receive. 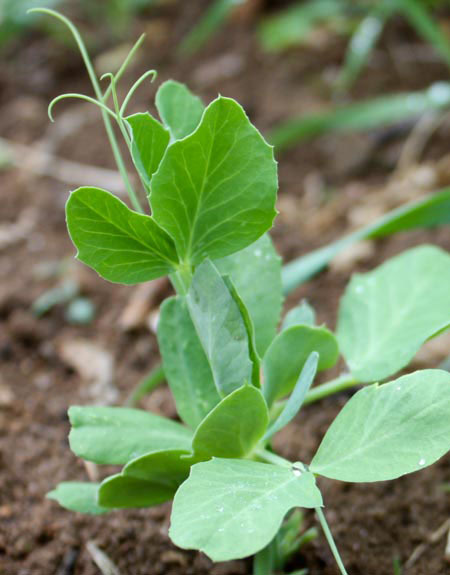 In the US, for example, garden peas grow faster than they do in the UK because cool, cloudy weather slows the plants down. Warm weather has its drawbacks, too. Garden peas stop flowering and wither away when temperatures rise above 85F, which happens by July in much of the US. Except in cooler northern climates, American gardeners must grow peas so that they finish bearing before summer starts to sizzle. Figuring out which peas to grow is pretty straightforward, because three characteristics – moderate height, determinate growth habit, and a talent for producing pods in pairs – come together in the most productive pea varieties. Determinate varieties produce flowers all the way to the stem tips, blooming in a flurry before producing a concentrated crop that can be picked in three weeks or less. Determinate varieties that grow to more than 24 inches (70 cm) tall produce more bearing nodes than shorter varieties. Taller indeterminate varieties have longer internodes to start with, and they become even longer when the plants attain flowering age. Like indeterminate tomatoes, indeterminate peas like 'Alderman' blossom and bear over an extended period of time on long vines, which is great if you live in a pea-friendly climate where cool weather lasts all summer. I do not. Regardless of their height, all garden peas grow in a predictable pattern. Each place where a leaf clasps the stem, and another leaf or stem emerges, is called a node. When pea plants grow past their tenth node, they begin to bloom. Peak production is strongest from the 12th to 16th nodes. Then there is the matter of whether or not the variety produces pods in pairs. Older varieties typically pop only one blossom per node, while newer ones produce two. For example, popular English varieties including 'Hurst Greenshaft' and 'Kelvedon Wonder' are double podded, as are American-bred 'Knight', 'Mayfair' and 'Mr. Big'. These varieties are determinate, too, so they get on with producing pods rather than expending energy on long vines. These and similar varieties hold great promise for solving my shell pea shortfall, provided I get a nice, thick stand with no more than 4 inches (10 cm) between plants, because peas like to be crowded. I will also equip them with a sturdy trellis. I do not know why seed catalogs insist on proclaiming that this or that pea can be grown without support, which is simply not true. Even the shortest-growing peas will end up on the ground when they become top-heavy with pods, and besides, few plants are more fun to trellis than peas. Whether you use bare branches saved from tree pruning or weave a string tapestry between posts, peas eagerly grab on with their curling tendrils, and they won't let go. Do anticipate that your peas will grow taller than seed catalogs say, because happy pea vines will often surprise you as they reach for the sky. This season I will try my best, but I suspect that growing peas sufficient to fill the freezer will never happen because we will simply eat more of them fresh. It's an old story. In 1696, Madame de Maintenon, wife of French King Louis XIV, recorded that "Some ladies, even after having supped at the Royal Table, and well supped too, returning to their homes, at the risk of suffering from indigestion, will again eat peas before going to bed. It is both a fashion and a madness." Like the court of Madame de Maintenon, I am afraid I have a madness for fresh garden peas. "Can we safely assume that your recommended high-yield choices are Hurst Greenshaft Kelvedon Wonder, Knight, Mayfair and Mr. Big? We are in Maryland, having along cold spell into March - but we get very hot summers. I am wondering if planing in a partly shaded area (1/2 of day) of my garden will prolong pea production? " "The problem with a shady site is that the peas will grow slower with reduced sunlight, an unwanted tradeoff. In your area with humidity and viruses as possible factors, I would try Knight first and use it as a comparison for other varieties. You can't prolong production beyond a certain point in summer because of heat, but you can still get a good crop of peas. " "What kind of pea plant choices would you recommend for a first time pea grower in Kansas?" "You would do well with Knight or Mr. Big, but if you are shopping at retail racks, Laxton's Progress or Green Arrow make nice crops of peas, too. " "What kind of pea plant would you recommend for Central NY (Finger lake area) and is there different varieties that I could plant to stagger the production, like early peas, then peas that could tolerate the heat more so I could enjoy peas later in the summer?" "Patty, in your climate it would be practical to grow both fast maturing short-vined peas and an indeterminate variety like Tall Telegraph. The short varieties will bear their crop and quit, and the taller one will keep going for several weeks. " "hello I must say that I m really fond of ur blog....its really really wonderful and informative. regarding peas I have pea wando seeds...can I plant them now?? I plant my vegetables in containers. when I got the seeds we were having frost so I was recommended to plant after feb 15... but now some ate saying peas season is over :( plz suggest...summer starts may end n june...severe hot season"
"If you live where summers are hot, then an early start with peas is an excellent idea. Frost doesn't bother them -- I've had peas come up under snow. Good luck!"